The investment comes from major regional and global VC firms including Shorooq Investments, Middle East Venture Partners (MEVP), 500 Startups, Dubai-based Women's Angel Investor Network, Hala Ventures from Saudi, and Saned Partners from Lebanon. 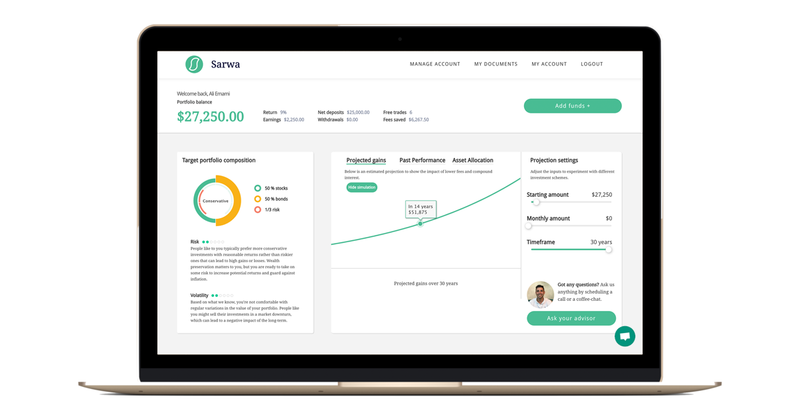 Sarwa, a digital and automated investment advisory platform in the region, has raised "over US$1.3 million" in its pre-series A round of financing. The investment comes from major regional and global VC firms including Shorooq Investments, Middle East Venture Partners (MEVP), 500 Startups, Dubai-based Women’s Angel Investor Network, Hala Ventures from Saudi, and Saned Partners from Lebanon. With the new investment round, Sarwa’s total funding to date stands at over $1.5 million since its launch in December of 2017. Mark Chahwan, co-founder and CEO, Sarwa. Image credit: Sarwa. The Sarwa story started in 2016, when co-founders Chahwan and Jad Sayegh were working in Canada in the financial services sector, and realized an obvious gap between wealth management services in North America and the Middle East region. Realizing that there was a need to democratize investing here in the region, the startup then joined Dubai's Fintech Hive at DIFC, and the duo also brought in co-founder and CMO Nadine Mezher, who joined the team with her market research and brand strategy background. Since then, after officially going live with their platform in February 2018, Sarwa has been combining the power of algorithms and human expertise to make investing easy, accessible and affordable for everyone in the region, Sarwa also onboarded its first set of clients under the Innovation Testing License- a special license for fintech startups as awarded by Dubai Financial Services Authority. The company, whose mission is to change the region’s perception of investing, and use emerging solutions such as automatic rebalancing, account opening in a few minutes via facial recognition, and more, reports a monthly growth of over 20% since going live, and has reached more than 1,000 registered users. Nadine Mezher, co-founder and CMO, Sarwa. Image credit: Sarwa. As for the team’s learning from closing its current funding, Chahwan reminds aspiring entrepreneurs that the process takes time and involves quite a bit of efforts from the founder’s side. “You need to establish a relationship with the VCs ahead of time, meet with them, introduce them to all the team members, and keep them updated on all aspects even it they are small milestones reached. Make it personal, and try to help them enjoy the process learning about the industry you operate in since they wont necessary be coming from the same background.” According to the entrepreneur, the criteria applied by most VCs to decide on an investment are mainly the founders, their mindset, and passion. “You also need to show good corporate governance practices and include due diligence on financial as well as operational and strategic aspects of the business,” adds Chahwan. “We are excited to take part of the Sarwa story. There is a growing interest in fintech regionally; meanwhile, the team is executing and delivering on its early stage milestones, putting the company on track to becoming a leader in this important vertical. Sarwa is adapting regionally a model that Wealthfront and Betterment have mastered in mature markets and the opportunity is ripe given the large segment of the population that is young, affluent and interested in investing." Sarwa platform. Image credit: Sarwa. "It is our sincere pleasure that Shorooq Investments is leading another financing round for Sarwa as we have seen how the company has grown since inception- from idea stage to Fintech Hive launch to product launch and now on-boarding hundreds of users. We are most excited to see that so many people are literally waiting in-queue to become Sarwa's customers as this validates our market thesis so far. We are honored to be working with such disciplined and execution focused company builders like Mark, Jad and Nadine, as one team to brainstorm how we can build Sarwa as the leading robo-advisor platform in the GCC." "Sarwa is an excellent startup led by a great management team. We believe in the fintech space and particularly in wealth-management as people keep migrating their wealth online and look for technologically-enabled solutions to manage and build their wealth. We are very happy to be on board."